During the cold open of the first “Saturday Night Live” of December, Alec Baldwin returned as a very mopey Donald Trump, who is sad about his growing legal problems — but also how Vladimir Putin seems to have a new BFF in Saudi Crown Prince Mohammed bin Salman (MbS). Baldwin also snuck in a joke at his own expense about being accused of punching someone over a parking space a month ago. The sketch saw Baldwin’s Trump taking a break from this weekend’s G20 summit in Argentina by stepping out onto his hotel room balcony to mope about this week’s crazy developments. He started, of course, by fretting about how the Mueller investigation has heated up. After complaining about having to hang out in Argentina with Europeans — “I’m a nationalist,” he said. “What did nationalism ever do to Europe?” — Trump was visited by his lawyer, Rudy Giuliani, played by a very game Kate McKinnon. The topic turned to what’s really bugging the POTUS — the way Russian president Vladimir Putin bro’d out with the Saudi Crown Prince with that high five-handshake-hug on Friday. 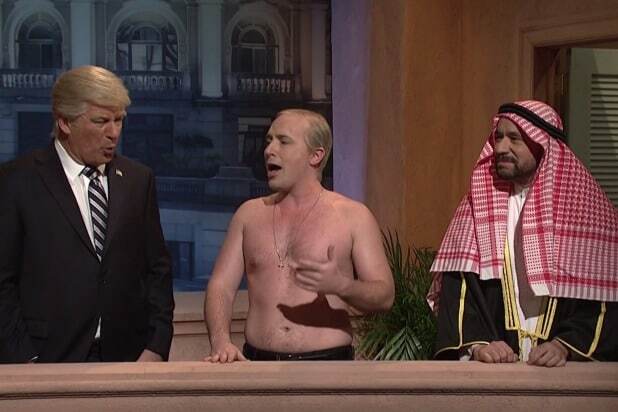 A bare-chested Putin, played as usual by Beck Bennett, arrived and pretended to console Trump. But the moment was ruined when MbS, played by Fred Armisen, showed up to cruelly remind Badlwin’s Trump that he’s no longer Putin’s bestie. After that, Trump got into the spirit of his Argentina trip — and the fascism joke he made earlier in the sketch — by singing a parody of “Don’t Cry for Me Argentina” from “Evita,” as he was joined by his administration, as well as Stiller’s Cohen. In the world of sketch comedy, there is no fraternity more prestigious than the "Saturday Night Live Five-Timers Club." Those who have proven their worthiness by hosting "SNL" five times are invited into an elite circle, where they don luxurious satin robes, smoke expensive cigars and, for their entertainment, watch current cast members fight to the death. Not counting his many guest appearances to play guys like Donald Trump, Baldwin has hosted 16 times, passing Steve Martin's record in 2011. Martin was there that night to demand a surprise drug test. The esteemed president of the Five-Timers Club was also the fastest to get to that milestone, hosting his fifth less than two years after hosting his first. In total, Martin has hosted fifteen times, most recently in 2009. Goodman ranks third on the all-time "SNL" hosting list with 13 episodes, behind only Steve Martin and Alec Baldwin. From 1976 to 1980, it was tradition for the "Heaven Can Wait" director to host the "SNL" season finale. In total, Henry hosted 10 episodes, including a Mardi Gras special. Hanks' fifth go-around as host in 1990 was what spawned the Five-Timers Club sketch. His 2016 appearance marks his eighth time hosting the show. The original anchor of "Weekend Update" hosted "SNL" eight times after being the first original cast member to leave in the middle of the show's second season. Walken was the first person to join the Five-Timers Club in the 21st Century after making his fifth appearance in May 2001. Though we haven't seen her in a Five-Timers' robe, her portrait is in the club's luxurious quarters. She holds the record for youngest host ever, having appeared on the show at age 7 following the release of "E.T." in 1982. Gould hosted the show five times in the '70s, but his sixth appearance was his last after being blindsided by the sudden departure of Lorne Michaels from the show in 1980. Shortly after playing The Penguin in "Batman Returns," DeVito joined the club with an "SNL" appearance in January 1993. Bergen was the first woman to host "SNL" and hosted five times from 1975 to 1990. After starring on the show in Seasons 2-5, Murray returned to host five times in the '80s and '90s. The man "SNL" once mocked for his film "Gigli" joined the Five-Timers club in 2013, shortly after winning the Best Picture Oscar for "Argo." Arguably the most famous "SNL" cast member among millennials, Tina Fey joined the Club in 2015 after a hosting career that included (and still includes) her famous Sarah Palin impression. The pop star's fifth appearance in 2013 saw "SNL" bring back the "Five-Timers" sketch, as Timberlake's induction was celebrated with a brawl between cast members Bobby Moynihan and Taran Killam. The actress made her fifth appearance in 2016, and kicked off her monologue by putting on a Five-Timers jacket handed to her by Kenan Thompson. After a season of guest appearances as Donald Trump's White House Press Secretary, Sean Spicer, McCarthy grabbed her Five-Timers jacket in Season 42. Dwayne "The Rock" Johnson hosted the finale of the 42nd season of "SNL"
Hill's five appearances as host spanned a decade, with the first coming in 2008 and the fifth on Nov. 3, 2018. Technically, Simon only hosted four times, but he's been included in "Five-Timers Club" sketches since he was the musical guest on a fifth show. He also owns arguably the most emotional moment in the history of "SNL": his performance of "The Boxer" in the cold open of the first post-9/11 episode.